Drills, Forstner Bits,Tapered Countersinks, Industrial Grade Barker Tenon Cutters, Long Tenon Cutters, Stake Makers & More! See our Grinder Mount Log Peeler! Add these Easy-to-Use log furniture building tools to your shop and you will have the opportunity to create custom log furniture and log railings for your home or to sell. With the right tools, you or others in your family will be able to make log furniture and build your own log railing within hours! Whether you are just beginning to build log furniture or a professional, our tenon makers and log furniture tools will help you take advantage of this rapidly growing Industry. 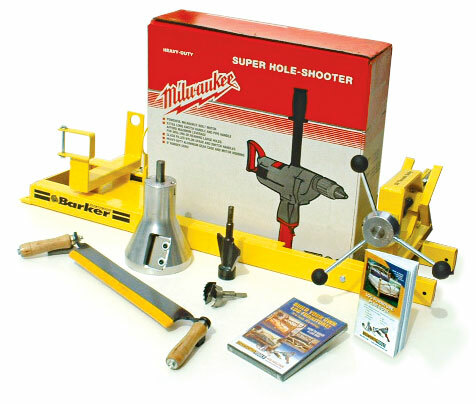 Take advantage of our Tenon Cutter and Kit Sale Now! Click on the image to the left to view a video clip of how the tenon cutter works! Call and order today at 406-886-2500! Montana is Sales Tax FREE! Log Furniture and Log Railing are so Simple to Build, It Takes Only Four Tools!